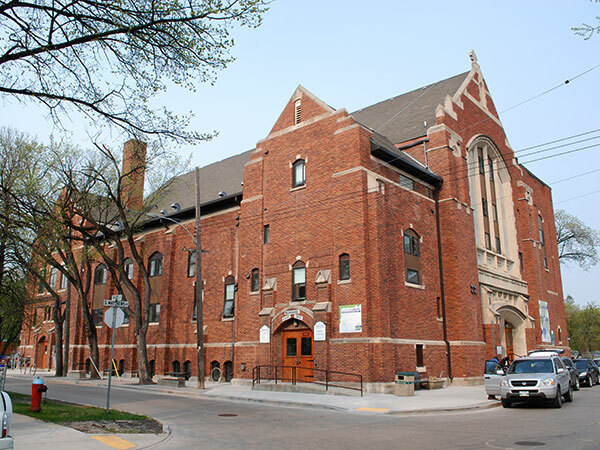 The history of this former Anglican church in Winnipeg dates back to 1896 with a the congregation of the Holy Trinity Anglican Church. A missionary parish was established at the corner of Ellice Avenue and Sherbrook Street, with lay reader A. O. Cheney supervising the construction of a wooden building. The parish was formally established as the St. Matthew’s Parish by Archbishop Machray in 1901. On 10 January 1909, a new brick structure replace the earlier one. This building, now known as the West End Cultural Centre, was later sold $16,000 to help finance the congregation’s building fund. 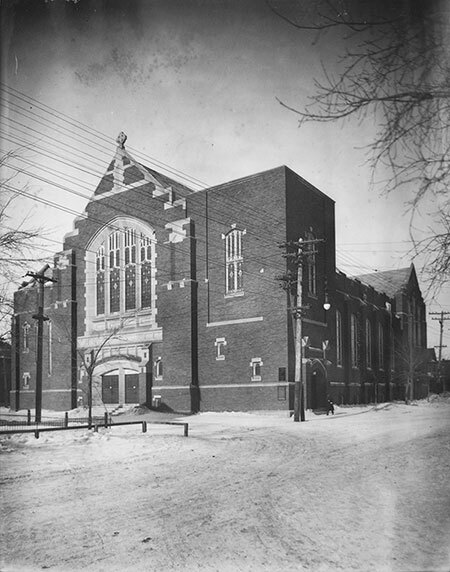 In 1913, construction began on a much larger place of worship at the northwest corner of Maryland Street and Livinia Avenue (renamed St. Matthews Avenue to commemorate the church), with the cornerstone laid on 7 May 1913. Based on designs of architects H. E. Matthews and R. G. Hanford, work was commenced by contractors Pattinson and Eilbech on a concrete, bedford stone, and steel-frame place of worship. Completed at a cost of $100,000, it opened on 9 November 1913. On 13 October 1940, a stained glass window was unveiled and dedicated to long-time minister Robert Benjamin McElheran. The site was consumed by fire on 13 November 1944, mere hours after 28th anniversary celebrations had concluded, with the blaze starting in the boiler room. 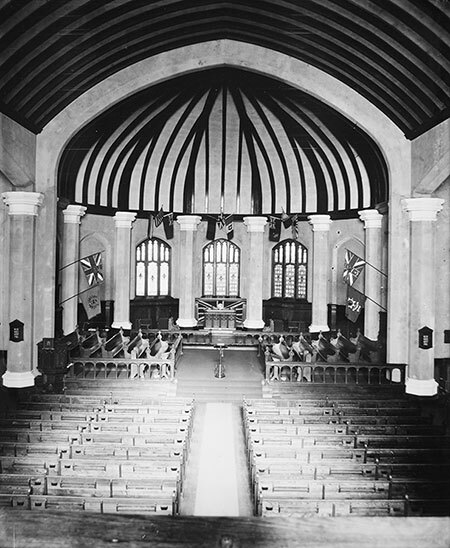 The building was gutted with losses including the chancel, organ, and colours of the 27th, 44th, and 78th Battalions, but the congregation’s wartime Honour Roll was saved. The rebuilding efforts began on 4 June 1945, with Col. J. N. Semmens providing architectural plans to the Claydon Construction Company. The Dominion Bridge and Iron Company also contributed to the project. Early estimates to rebuild were pegged at $70,000, with an envisioned re-opening later that year. The cost would balloon to around $127,000 and the term was increased on account of improvements, extensive overhaul, and need for temporary measures. The rebuilt facility was rededicated officially on 2 February 1947, along with a new stain glass window in tribute to McElheran. In 2013, work began to convert the church into a $6.6-million, multi-unit affordable housing complex. Now known as the WestEnd Commons, it opened to tenants on 1 November 2014. “Corner stone of St. Matthew’s laid,” Winnipeg Tribune, 8 May 1913, page 9. “Would change name of Livinia Avenue to St. Matthews,” Winnipeg Tribune, 3 October 1913, page 1. “Opening of St. Matthew’s Church[,] Livinia Avenue,” Winnipeg Tribune, 10 November 1913, page 4. “Saving our lives,” Winnipeg Tribune, 31 October 1914, page 19. “New pastor of St. Matthew’s is welcomed,” Winnipeg Tribune, 2 September 1930, page 2. “Will dedicate window to Dr. R. B. McElheran,” Winnipeg Tribune, 12 October 1940, page 19. [Photo caption; “To be dedicated”], Winnipeg Tribune, 12 October 1940, page 19. “St. Matthew’s to mark its 45th anniversary,” Winnipeg Tribune, 8 November 1941, page 15. “Fire wrecks St. Matthew’s Church,” Winnipeg Tribune, 13 November 1944, page 1. “St. Matthew’s Church,” Winnipeg Tribune, 14 November 1944, page 8. “New St. Matthew’s,” Winnipeg Tribune, 17 November 1944, page 13. “St. Matthew’s rushes reconstruction plans,” Winnipeg Tribune, 20 November 1944, page 11. [Photo caption “Not the Blitz - but Winnipeg”], Winnipeg Tribune, 18 November 1944, page 1. “Temporary roof will allow use of St. Matthew’s for Christmas,” Winnipeg Tribune, 30 November 1944, page 17. “St. Matthew’s parishioners pledge $22,000,” Winnipeg Tribune, 5 December 1944, page 9. “Faith renewed in basement,” Winnipeg Tribune, 26 December 1944, page 9. “Farewell to fire ruins,” Winnipeg Tribune, 4 June 1945, page 11. “St. Matthew’s Church building fund reaches $76,297,” Winnipeg Free Press / Winnipeg Tribune, 12 January 1946, page 21. “Church still rebuilding,” Winnipeg Tribune, 6 November 1946, page 15. “St. Matthew’s will celebrate golden jubilee,” Winnipeg Tribune, 9 November 1946, page 10. “Rebuilt St. Matthew’s dedication on Sunday,” Winnipeg Tribune, 1 February 1947, page 17. “Crowd attend dedication at St. Matthew’s,” Winnipeg Tribune, 3 February 1947, page 17. “St. Matthew’s social, service postponed,” Winnipeg Tribune, 3 February 1947, page 11. “St. Matthew’s members honor Archdeacon and Mrs. Calvert,” Winnipeg Tribune, 21 December 1948, page 11. “Calvert is installed as Dean in Victoria,” Winnipeg Tribune, 7 January 1949, page 20. “Windows dedicated by former Rector,” Winnipeg Tribune, 10 May 1949, page 5. “Get acquainted,” Winnipeg Tribune, 22 June 1949, page 6. “Transformation turns Anglican church into housing,” Winnipeg Free Press, 9 March 2013. This page was prepared by Nathan Kramer, Maria Zbigniewicz, and Gordon Goldsborough.